Sheep 201 is a Beginner's Guide to Raising Sheep. 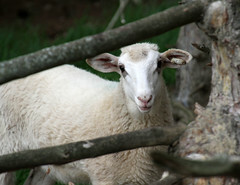 The information should be useful to people raising different kinds of sheep and utilizing different production systems. At the same time, all information needs to be adapted to local conditions, breeds, and production practices. Text and images from Sheep 201 may be reprinted (for educational purposes only) with permission of the author. A printed version of the web site is being developed. Sheep 201 is written by Susan Schoenian (Shay-ne-un). Susan has been involved with sheep since she was 7 years old. When she was growing up, her family raised and showed Dorset and Southdown sheep and sold lambs to the ethnic markets. 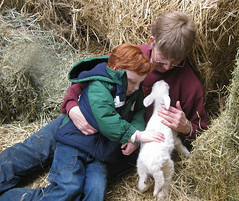 Currently, she raises purebred and crossbred Katahdin sheep on her small farm, called The Baalands, in Clear Spring, Maryland. She sells breeding stock and lambs for meat. Susan is the Sheep & Goat Specialist at the University of Maryland's Western Maryland Research & Education Center in Keedysville, Maryland. She has been with University of Maryland Extension since 1988. Susan began her extension career as an agricultural extension agent ("county agent") in Wicomico County, Maryland. For several years, she served as a Farm Management Specialist for Maryland's nine Eastern Shore counties. Susan's first job out of college was as Sheep Specialist for the West Virginia Department of Agriculture. In West Virginia, Susan was a USDA-certified livestock grader and market news reporter. During high school and college, Susan worked at veterinary hospitals. Susan has achieved the rank of Principle Agent (full professor equivalent) at the University of Maryland. 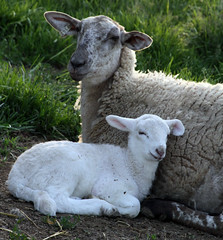 She is a member of many professional organizations that pertain to sheep, including the American Consortium for Small Ruminant Parasite Control(ACSRPC), whose web site she maintains at www.wormx.info. 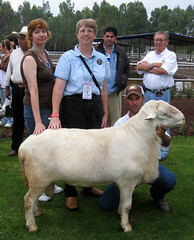 For many years, Susan judged sheep, goat, livestock, wool, and carcass shows, but is now "retired" from this endeavor. She started the 4-H/FFA Meat Goat Show at the Maryland State, but has also stepped down from this role. Susan conducts a Junior Sheep & Goat Skillathon at the annual Maryland Sheep & Wool Festival. Susan earned B.S. and M.S. degrees in Animal Science from Virginia Tech and Montana State University, respectively. She also attended The Ohio State University. While in college, Susan participated in both the livestock and meat judging teams and was a member of the Block and Bridle Club. The title of her Master's thesis was "Direct and Correlated Responses to Selection for Reproductive Rate in Rambouillet Sheep." Susan has traveled extensively on behalf of the University of Maryland, the Maryland Department of Agriculture, USDA, CNFA, ACDI-VOCA, and Winrock International. She has given invited presentations in several countries. So far, her travels have taken her to Poland, Hungary, Russia, Spain, France, Kazakhstan, South Africa, Moldova, Egypt, Brazil, China, Canada, Mexico, Barbados, Jamaica, Dominican Republic, Trinidad and Tobago, and the British Virgin Islands. Susan's first trip was to the Soviet Union, a year before it broke up. Her favorite trip was to Egypt, where she had the chance to interact with Bedouin shepherds. Her most recent trip was to China, where she spoke at a conference on sheep industry development. Most of the images in Sheep 201 (and 101) link back to Susan's Flickr™ site. Photography is a life-long hobby of hers. Images may be used with her permission. Photo credits are provided for third party images. Images not taken by Susan require permission from the photographer or image source. Many more images pertaining to sheep and goats may be viewed at Susan's Flickr™ site. Susan has developed various other web sites and social media pertaining to small ruminants. These other sites can be accessed from the menu bar above. She also utilizes various social media to disseminate information about small ruminants. Late updated 18-Jan-2019 by Susan Schoenian.